The Tybee Island B-47 crash was an incident on February 5, 1958, in which the United States Air Force lost a 7,600-pound (3,400 kg) Mark 15 nuclear bomb in the waters off Tybee Island near Savannah, Georgia, United States. During a practice exercise, an F-86 fighter plane collided with the B-47 bomber carrying the bomb. To protect the aircrew from a possible detonation in the event of a crash, the bomb was jettisoned. Following several unsuccessful searches, the bomb was presumed lost somewhere in Wassaw Sound off the shores of Tybee Island. The device has, as of 2017, never been found or recovered. 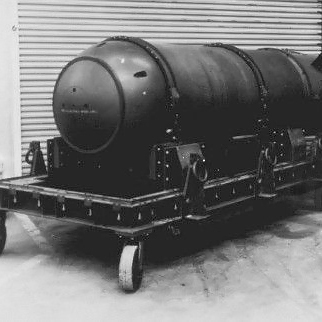 An example of the type and style of nuclear device that was lost. UNPLEASANT FACT: You're more likely to be killed by a cow than by a shark. This photo taken in 1966 by Rev. Ralph Hardy, a retired clergyman, was among the most terrifyingly mysterious images of our time. According to the reverend, he only wanted to capture the grandeur of the Tulip Staircase inside the Queen’s House section of the National Maritime Museum in Greenwich, England. But after having the images developed, he saw in one of the photos a shrouded figure climbing the stairs. According to experts, the image has not been altered or tampered with. I was like 12 in a bathroom stall in Walmart, you know, using the bathroom, and I got this super weird feeling that someone was watching me. I slowly moved my eyes upward and toward the adjacent stall and there was some old man standing on the toilet, watching me poop. I was terrified of public bathrooms for years, and they still make me uncomfortable.